You are preparing for a beautiful Sacrament, and we pray that your time of engagement is filled with a deeper appreciation and understanding of each other and of God's plan for your marriage. Each couple who begins Marriage Preparation at St. Joseph receives preparation that is designed for each individual couple. The first step after engagement is to contact the Parish Office. We will guide you through the next parts of the process, including taking a Prenuptial Inquiry and setting up a meeting with Father Cormier. We will work with you to find the Marriage Preparation Program that is best for you. 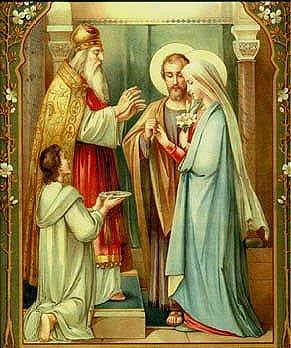 Please click below to read the Marriage Guidelines for St. Joseph and learn about our parish policies.